Pictures taken by Jane Noel. Dean Noel was born in the heartland of Ohio, but his heart has always been in the wild places of the west. In 1986, shortly after being offered a one man show by the Butler Art Museum in Youngstown, Ohio and National Wildlife Federation, Dean moved his family to Jackson Hole, Wyoming to take advantage of the breath taking scenic inspiration. Since that time, he has been featured in Safari Club Magizine and Images of the West, as well as in galleries in Aspen Colorado, Carmel California, Jackson Hole Wyoming, Sante Fe New Mexico, and Kalispell, Montana. Dean's work is widely sought after by many collectors across the country, including NASCAR champion Richard Petty. He has also won numerous awards throughout his career, from places like the Cheyenne Frontier Old West Museum, The Wyoming Game and Fish, and the Wind River Artists Guild. Dean has released several limited edition prints, one of which was selected to represent the Yellowstone Grizzly Center, in West Yellowstone, Montana. Dean is also known for his custom, commissioned pieces that he designs with his clients to specifically fit their home and their individual needs. Dean is a member of the National Museum of Wildlife Art, the Safari Club International, the Foundation for North American Wild Sheep, the Rocky Mountain Elk Foundation, and the Wind River Artist Guild. 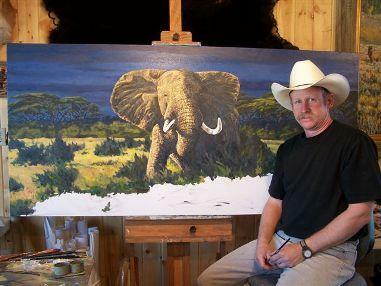 Dean and his wife, Jane, spend much of their time in the outdoors researching and painting on location. It is this deeply rooted familiarity, love, and respect for wildlife and the environment, that is evident in all of Dean's art.